Editor in Chief Ari Nussbaum says her farewell to Mills. Three Campanil staff members held a session at ACP about how to cover the queer community on college campuses. The Campanil placed in four state-wide categories and one national category this year. Students continue dialogue of transgender experiences on campus in regards to the first Transgender Day of Visibility week. The Mills College community is still working to be more inclusive of transgender and gender fluid students nearly a year after officially admitting transgender students. Editor-in-Chief Ari Nussbaum writes about her leadership role and what she learned at ACP Conference. The Associated Collegiate Press (ACP) annual national conference will take place in Los Angeles from Feb. 26 to March 1. 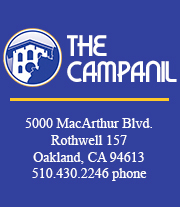 Ari Nussbaum is the former Editor in Chief for The Campanil during the 2014/2015 school year. Former Chief News Editor. She graduated in 2015 with a degree in English Creative Writing and journalism. Tweet at her @AriNussbaum.